See our Visitor Info page for full access details and directions. On June 1, the new NYC Ferry service started, and the Red Hook stop is a few yards from the MARY A. WHALEN. The Mary A. Whalen was launched May 21, 1938, and we have some forward-looking plans for the old girl! While we look for a site to create our intended maritime center with building space, the oil tanker MARY A. WHALEN has been the site our offices and many programs. She is the only oil tanker cultural center in the world. She is the last of her kind in the USA. She is on the National Register of Historic Places, to understand why, see her history page. A tremendous about has been done since acquiring the MARY in 2006! In 20017, the ship was hauled out and the hull blasted, painted and zinc anodes applied. We have repainted multiple cabins. December 2013 to April 2014, the galley underwent a significant renovation. The teak rail around the bridge deck has been restored. the wood doors and windows in the wheelhouse are undergoing restoration. Once we get our offices off the ship, we can deal better with those spaces. We have secured most of the parts needed to restore her engine. NYC is not a boat-friendly city, but we have a workaround plan so the MARY A. WHALEN can visit communities which lack a pier or have new piers without tie-up infrastructure. To do programming in such places, we plan to use a solution called "spudding." In maritime terms, a “spud” is a piling used to pin a vessel in place. The East River Ferry stops use “spud barges,” or barges pinned in place by spuds (effectively their own removable pilings.) Those ferry stops move with the waves because they are barges not piers. 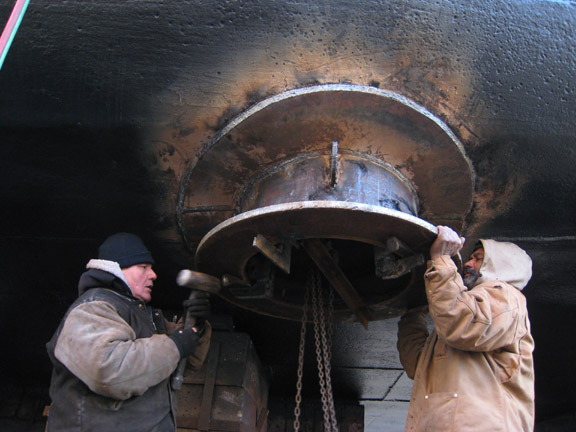 In 2008, we completed the first step of spudding the MARY A. WHALEN by installing spudwells (sleeves through the hull) through which we would insert the spuds. Many new waterfront parks were not designed with boats in mind (something PortSide would like to change, and have no cleats or bollards on their piers, so there is no way for boats to tie up. Support our #Piers4Boats #BoatJustice efforts by using that term on Twitter. Although she is quite long, the MARY A. WHALEN is "shallow draft" (does not need deep water) and can therefore visit many areas in and near New York City. Her shallow draft plus spuds means that she will be able to go MANY places. Further in the future, the tanker's eight cargo tanks (2,800sq ft) which held the fuel products she carried will be converted for human use and house exhibit, classroom and function space. They have been cleaned of all fuel residues and are spacious rooms 15 1/2' high. They are shaded in grey in the drawing at the top of this page. The MARY A. WHALEN went out of service in 1994 because her crank shaft was scored at the aftmost cylinder. Soon thereafter, Eklof sold the boat to Erie Basin Associates (Hughes Marine & Reinauer Transportation). Because the fuel moving business is so competitive, Eklof cannibalized the engine, removing the heads, pistons and rods, so that Reinauer couldn't repair the MARY and put her back in service. In late 2008, PortSide was tipped off by Bernie Ente that a younger Bushey tanker, the KED, was being scrapped in Seattle. We had no immediate plans to restore the engine; however, everyone we consulted said that the parts are so rare that we should get the KED parts to ensure we had the option to restore our engine down the road. From the KED, we got 6 cylinders, 6 heads, 6 pistons, 1 connecting rod, a whole fuel pump assembly, the lower half of the engine block with a flywheel and crankshaft. Thank you Gerry Weinstein for the donation which made the purchase of these parts possible. The story is covered on our blog. Our new acquisitions include things we didn't need, so we can sell some parts to defray costs. We lack 5 connecting rods. If you want to help us find more, we seek 5 rods for a Fairbanks Morse 37E12, six cylinder, direct reversing engine. The MARY A. WHALEN originally had 4 davits for lowering the lifeboats. The tanker currently has 1 davit. We got 2 from the KED, so we are missing only one. We are missing other things from the engine room, and bits of speaking tubes. Please get in touch if you have access to old parts like these. The exterior of the MARY A. WHALEN is being restored in large part with labor from the painters' union District Council 9 which is using the ship as a training site. We give them a site, they give us labor, and we partner in training union labor. The paint is thanks to a generous donation by International Paint.